For the most part inspecting sweet peppers is fairly simple. There are a few common defects you will notice, but you should always be on the look out for decayed peppers. When you are inspecting the peppers, and you come across one that has decay, you must determine and note if the decay is affecting the stem of the pepper, or if the decay is affecting the wall or calyx of the pepper. If you find decay affecting either the calyx or the walls (the pepper itself), you are allowed only 2% of the peppers with this type of decay….any more than 2% and the lot of peppers will fail to grade U.S. No. 1. 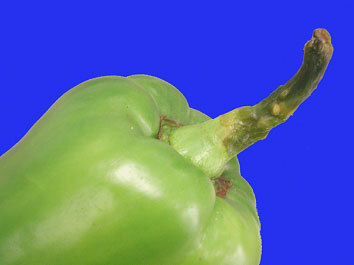 If you find decay on the stem of the pepper, you are allowed a greater tolerance. The USDA Grade Standard allows up to 5% of the peppers with decay affecting the stems…..if you find more than 5% of the peppers with decayed stems, the lot would fail to grade U.S. No. 1. If you find decay affecting the stem and the calyx of any one pepper you most score the pepper against the more restricted tolerance. 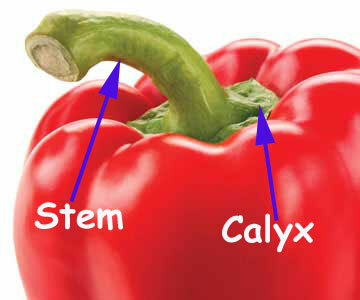 You would score the pepper once, as decay affecting the walls and calyx. Many new inspectors become confused when seeing discolored stems and decayed stems. They are quick to score discolored stems as peppers with decayed stems. Use caution when you encounter discolored stems. You MUST rub the stem with your thumb and fingers and determine if any of the stem tissue rubs off, or disintegrates in your fingers. Discolored stems will be dry, and no tissue will rub off. On the other hand, a stem with decay (as shown in the image above) will be moist, usually discolored, and a small amount of tissue will rub off when touched.